2016, de Gruyter, Berlin and New York, 122 p.
In Japan, today, longevity has not meant a reduction in years of dependence. As a result, anticipation of a long life also brings the troubling anticipation of problems like chronic illness and loneliness. How do older adults facing such a future create hope? 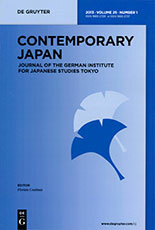 The purpose of this paper is threefold: (i) to propose a conceptualization of hope as “lunar aesthetics,” that is, not as anticipation of achievement but as a process of loss and renewal; (ii) to link this process to aesthetic forms and ritual practices from my fieldwork with older adults in Kyoto; and (iii) to critically evaluate the ways current formal long-term care diverges from “lunar” hope. Drawing on Japanese associations between the moon, hope, and rituals memorializing the spirits of the dead, this paper argues that older adults engage with an alternative interpretation of hope based on transience and transcendence. Both of these offer hope to older adults by reorienting the temporal boundaries of personhood, to experience change (including decline and death) as an inherent aspect of becoming part of a larger narrative of linked generations or the natural state of life. This essay analyzes Japan’s otaku subculture using Hirokazu Miyazaki’s (2006) definition of hope as a “reorientation of knowledge.” Erosion of postwar social systems has tended to instill a sense of hopelessness among many Japanese youth. Hopelessness manifests as two analogous kinds of refusal: individual social withdrawal and recourse to solipsistic neonationalist ideology. Previous analyses of otaku have demonstrated its connections with these two reactions. Here, I interrogate otaku culture’s relationship to neonationalism by investigating its interaction with the xenophobic online subculture known as the netto uyoku. Characterizing both subcultures as discursive practices, I argue that the similarity between netto uyoku and otaku is not one of identity but one of method. Netto uyoku discourse serves to perform an imagined nationalist persona. While otaku elements can be incorporated into netto uyoku performance, other net users invoke the otaku faculty of parody to highlight the constructed nature of netto uyoku identity through ironic recontextualization. This application of otaku principles enables a description of otaku culture as a form of social knowledge, reoriented here to defuse the climate of hopelessness purveyed by the netto uyoku. In the final section, I offer examples of subcultural knowledge being applied to national and international issues in order to indicate its further potential as a source of enabling hope for Japanese youth. Japanese social order emphasizes a superior’s responsibility for their subordinates’ well-being. This traditional “right to benevolence” is a wellspring of hope for workers. This paper describes how, in the wake of changes in employment practices since the mid-1970s, citizens’ groups and labor lawyers creatively combined advances in medicine and legal knowledge with this right to benevolence in lawsuits seeking compensation for injuries caused by overwork. The social movement against karōshi (death due to overwork) that arose from these suits first sought workers’ compensation system reforms. Later, they won legislative remedies. Rulings in Japanese courts, including the Supreme Court, affirmed employers’ legal responsibility for worker well-being to include care for accumulated fatigue and mental health. Buoyed by these successes, activists and victims’ families hopes of preventing karoshi reached new heights with the June 2014 passage of the Karoshi Prevention Countermeasures Promotion Law (Karōshi tō bōshi taisaku suishin-hō). Karoshi compensation victories, administrative rule changes, and legislative reforms raised public awareness of overwork and exploitative management practices. Nevertheless, we must conclude that, although karoshi legislation gives hope for a legal regime of employee care rights, the current law is weak and remediation only addresses the worst cases. Moreover, participation in the legislative process risks limiting the movement’s future influence. The recruitment of foreign researchers has become an indispensable component of Japanese policy makers’ efforts to globalize and improve the country’s scientific institutions. By promoting the employment of foreign scientists in temporary research positions, Japan participates in the increasingly transnational circulation of academic knowledge workers. Scientists, discursively conceptualized as highly skilled workforce, are seen as participating in privileged global movements. However, the young foreign scientists enlisted to advance Japan’s research sector encounter considerable uncertainties in their work and personal lives. Focusing on the experiences of young life scientists in Osaka, this article investigates transnational scientific mobility from below. It complicates the notion of scientific workers as privileged global travelers, and examines how mobility is embedded in the minds and enlivened n the bodies of scientific workers themselves. By inquiring into the underlying relationship between the practice of mobility and hope, the article explores the diverse methods foreign researchers employ to account for the uncertainties they encounter during their own transnational movements. Demonstrating how young researchers experience and make sense not only of mobility, but also its loss, the article highlights the ways foreign scientists engage with Japan, and elaborates on the significance of immobility practices and imaginaries. This paper details the “cylinder-gruel rite” (tsutsugayu shinji) observed annually on 15 January at Suwa Taisha, a Shintō shrine complex in Nagano Prefecture. The oracular ritual is an instance of the Japanese tradition of New Year’s divination (toshiura), and involves the boiling of hollow reeds or bamboo in rice gruel to augur crop yields and economic prospects for the coming year. Whereas Japan’s modernization and shift away from an agricultural economy has rendered such observances archaic, their continued practice cannot be explained solely by their heritage value as survivals of pre-modern tradition. Careful analysis of the Suwa oracle’s formal structure within the frame of Shintō practice reveals that the ritual works to intimate a transcendent sociality, an infallible source of divinatory revelation that provides a sustaining source of hopeful momentum. Consideration of the documentary history of the ritual further suggests the ways that the ritual has been leveraged by various actors throughout history to support imagined aspirational trajectories. Following Zigon’s anthropological critique that hope does not obviate human agency but necessitates and sustains it, this paper discusses the possible implications of these generative/sustaining and imagined/instrumental modes for an anthropological engagement with hope.